I reviewed the newly added field in CDM v5.1. And I would like to ask if I understood the new field well. I read the explanation on the OHDSI wiki and understood as follows. If the above is misinterpreted, please give me a detailed explanation. I think you nailed it. If you think the documentation could be in need of some improvements, let us know. @Christian_Reich, could you clarify what does the word immediately in visit_occurrence.preceding_visit_occurrence_id description means? Should this field be populated for any previous visit or is there a rule according a date range between visits? And could you explain the meaning of this new field, for which situation a linked history of visits might be useful? Good question. The meaning was indeed immediately (same day or day before), but now we have VISIT_DETAIL, so these Visits stacked up against each other should go to that one. @rimma; @Gowtham_Rao: You are the main sponsors of this stuff. What do you think? You are the main sponsors of this stuff. Visit_detail is the child of the visit_occurrence. Sequential children maybe represented using preceding_vi*. There is no need to infer sequence during ETL if the source data did not have the sequence. Inferring sequence may be done thru temporal association at analytic time. If the source data has a sequence, then preceding_vis* maybe useful. I understand, but the question is about what “preceding” means. Is it “immediately preceding” or could there be a gap? For VISIT_DETAIL I think it should be immediate (same or previous day). For VISIT_OCCURRENCE only in rare coincidence, where one hospitalization is truly followed by another one the next day, but they are not considered the same thing. Good question. I don’t know @rimma ? But all that is part of the ETL. If you have, say, a claims database with claims from Blue Cross Blue Shield you will preserve it. If you have an EHR database you may have to interpret a hell of a lot to get it right. admitting_source_concept_id: A foreign key to the predefined concept in the Place of Service Vocabulary reflecting the admitting source for a visit. discharge_to_concept_id:	A foreign key to the predefined concept in the Place of Service Vocabulary reflecting the discharge disposition for a visit. For the above two fields in visit_occurrence and visit_detail, we are being asked to used the place-of-service vocabulary. Athena Place-of-service vocabulary belongs to the place-of-service domain, and class place-of-service. My question is around OMOP CDM design principles – should the concept_id’s populating admitting_source_concept_id and discharge_to_concept_id have the domain’s ‘admitting source’ and ‘discharge to’? Or is it ok to use place-of-service domain to populate these fields? Apologies for continuing on the old thread. Can you please help me with the below post? Though I have mapped few fields, I am quite confused as to how can I map the remaining fields? care_site_id: Same thing. This is supposed to contain the Care Site the Visit happened. 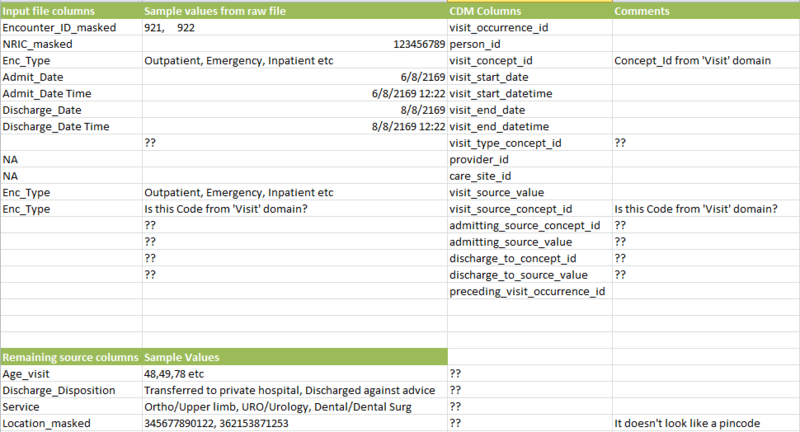 visit_source_concept_id: When you map a code from vocabularies “Medicare specialty”, “CMS Place of Service”, ‘NUCC’ or ‘ABMS’ and it is a non-standard concept mapped to a standard one, the non-standard one goes here. In your case, you seem to be operating off of short text strings. In that case, you may not fill this field at all. admitting_source_concept_id and discharge_to_concept_id should contain the same Visit concepts you use in visit_concept_id. Except we need to work on birth and death, still. Service is not used in OMOP: Visits don’t have specialty. Only providers do. Location_masked: Looks like you want to put that into the CARE_SITE table, and then link the corresponding care_site_id to the equivalent field in the VISIT table.